There is no need to believe in magic or have proof of its existence, so that in a moment of worry or before something that is fervently desired, people take an object, say a phrase or make a gesture, to think that they can attract the Fortune, repel bad luck or change destiny. A simple and usual example, which is often done unconsciously, is to cross your fingers so that things come out as you wish. These are called superstitions, and they are popular or personal beliefs that go against reason, but in which they are trusted to work. 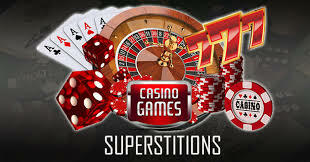 Players, both gambling and any other sport, are known as extremely superstitious people, who usually perform a series of actions that they believe will be the cause of their success and triumph. The most frequent ones will be described immediately in a casino gaming room. This belief arose from a time when players without respect to the rules and their opponents wanted to turn the game in their favor. These would cover a side of the dice with an adherent component that activated with moisture. In such a way that blowing the dice before throwing them generated enough steam to dissolve the substance and, therefore, it could be ensured that each die would fall in the position and number that was required. The dressing of red color comes from the Chinese belief regarding this color. Well, the natives of that country think that this color represents luck, wealth, joy among many other things. For this reason, it is quite frequent that at weddings the red color predominates, which is practically used in everything from money envelopes to the wedding dress. As expected, this practice spread to other areas, especially in games of chance. The reason why, the casinos in their majority have in their decoration walls, carpets, chairs and other elements of red or golden color, which also is considered a color that attracts wealth and fortune. Perhaps this is one of the rituals most used by people when they want to succeed at an important time. • Rabbit’s foot. This is a true classic and quite appreciated in the circle of players. However, not everyone is adequate, because the belief is that luck is given by a rabbit that has been captured in a cemetery. • Coins of precious metals. Silver or gold is a symbol of fortune, therefore it is believed that wealth calls more wealth. • Stamps from San Pancrazio. It is said that this is the patron saint of economic prosperity. • Four leaf clovers. Finding a four leaf clover is quite difficult, so the fact of finding one was attributed to be good luck. • Rainbow. It comes from an Irish tradition where it is said that at the end of each rainbow, you secretly find a pot full of valuable gold coins. Other objects are horseshoes, figures of frogs or raccoons. However, each player may have his personal object, which may be different from those mentioned above, but also serve for them the function of transmitting security and good luck. The emergence of these beliefs comes from various cultures. In the case of number four, it comes from China, where it is believed to be an unfortunate digit because its pronunciation is very similar to the word “death”. On the other hand, number 13 is a terror for Westerners. This was born as the representation of the thirteenth apostle of the bible that was listed as a traitor. Contrary to the belief that crossing the fingers causes the wishes to be fulfilled, crossing the legs while a bet is being made, it is believed that good fortune is being annulled. So the best way to play is to sit upright and keep your feet apart and always in contact with the ground. Counting the money before ending the game or immediately after, is a little bad taste. This is because it affects the sensitivity of others and is also associated with the belief that pride comes before the fall. Not only can it cause discomfort in other players, who can deconcentrate. But superstition says that when you whistle or sing while playing, it makes the gods of the game angry. However, this practice was soon abandoned due to the high probability that the dice would remain attached to other areas or objects that were on the table or in its adjacencies.